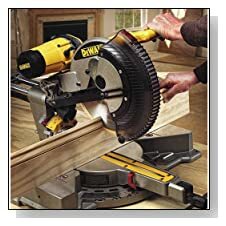 This DEWALT DWS709 Slide Compound Miter Saw cuts at a healthy 12 inches ideal for most typical miter saw jobs for all but the seasoned professionals. DEWALT have added this saw to their already wide range of offerings, the reason this model should be of note is its very competitive price point making it a tempting addition to the home user. One key feature needed in this miter saw is the tall sliding fences that will support crown molding up to 5-1/2" nested and base molding up to 4-1/2" vertically against it. The exclusive back fence design cuts up to 2x14 dimensional lumber at 90 degrees, and 2x10 at 45 degrees. This saw also has a compact, lightweight design weighing in at 51 lbs that allows for easy transport and storage in most workshops. This saw has a fully adjustable stainless steel miter detent plate with 13 positive stops, this should improve your productivity and ensure all cuts are pretty accurate. One important note, this is actually a dual bevel sliding compound miter saw which means that you can tilt the saw either to the left or right side and cut moldings laying flat. 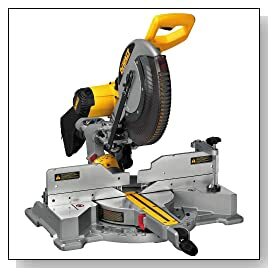 Although this saw is very similar to the current DEWALT DWS780 model , you must be aware that for $200.00 less there are some features this saw does not have. Key features missing are the maximum width it can cut is shorter and It does not have a light or laser. What the DEWALT DWS709 Slide Compound Miter Saw delivers is a fantastic tool ideal for weekend Workers seeking professional quality for their tasks.